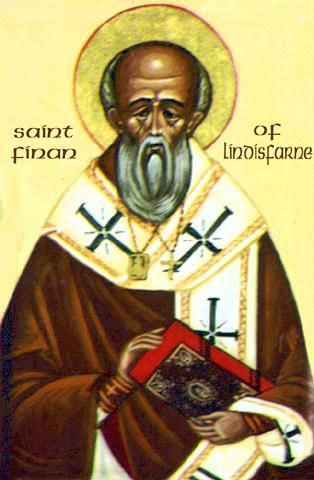 In addition to his duties at Lindisfarne, St. Finan was primarily a missionary, spreading the Catholic Faith the world over. He was particularly famed for having converted Peada, the son of Penda and King of the Middle Angles, along with his “Nobles and Thanes”. St. Finan then gave Peada four priests, including Diumma, whom he consecrated Bishop of Middle Angles and Mercia, under King Oswy. Unfortunately, not all of St. Finan’s story is untarnished. One of his foremost foundations, the Abbey of Whitby, was the scene of a famous controversy which resulted in the withdrawal of all the Irish Monks from Lindisfarne. It seems that there was a discrepancy between the Irish and Roman Catholics over exactly when Easter was to be celebrated. On one occasion, King Oswy and his Court were celebrating a feast on Easter Sunday with St. Finan, while on the same day Queen Eanfled and her attendants were still fasting and celebrating Palm Sunday. This angered the Roman Catholics so that the Irish Monks were forced to abandon their monastery on Lindisfarne. Today, there are several tributes to St. Finan throughout Ireland including Saint Finan’s Bay at the tip of the Iveraugh Peninsula in County Kerry, and St. Finan’s Hospital in Limerick (which is a mental institution !!). It is unclear from this point what became of Saint Finan. Whether our Finan family is actually descendant of him, or if the connection is only in name will probably never be known for sure.